A South Florida man named Cesar Sayoc, Jr., was arrested for allegedly mailing at least a dozen pipe bombs to prominent Democrats, military officials, and cable TV network CNN. 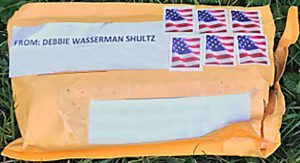 Attorney General Jeff Sessions announced that Sayoc was charged with five federal crimes, including illegal mailing of explosives and threats against former presidents. 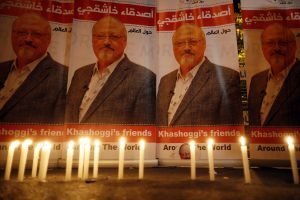 Saudi Arabia’s government says that U.S.-Saudi journalist Jamal Khashoggi’s murder was a “premeditated” act. At least 18 Saudi security and intelligence officers, as well as royal advisers, have either been fired or arrested as part of the Saudi investigation. The admission came after weeks of changing stories. President Trump announced plans to withdraw the U.S. from a nuclear weapons treaty with Russia that oversees intermediate-range missile use. He accused Russia of violating the treaty’s terms and said he would not rejoin unless China was also regulated. 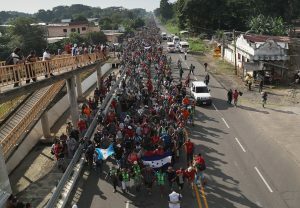 The caravan of thousands of Central American migrants continued their trek towards the United States, crossing the Mexico-Guatemala border, with many either requesting asylum in Mexico or turning back from exhaustion. Having already threatened to slash humanitarian aid to Honduras if immigrants did not halt their journey, President Trump is considering executive action to bar immigration and deny asylum requests at the U.S.-Mexico border. He had also requested that more troops be sent to help with border enforcement. Out in the Pacific Ocean, the U.S. commonwealth of the Northern Mariana Islands suffered major damage from Super Typhoon Yutu, which now heads west towards Southeast Asia, with residents of the Philippines and Taiwan monitoring the storm as it approaches. President Trump took aim at Medicare drug prices with a proposal to lower costs by directly negotiating with drug companies. The plan would be a pilot program and would bypass Congress. Pharmacy drugs would largely not be affected, but doctor-prescribed drugs and hospital treatments for conditions like cancer and rheumatoid arthritis would. Retired Supreme Court Justice Sandra Day O’Connor announced in a public letter that she was bowing out of public life due to suffering from dementia and possibly Alzheimer’s disease. The 88-year-old was the first woman on the Supreme Court. Google faced a public reckoning when The New York Times revealed the company shielded several company executives from sexual misconduct allegations and paid them to leave. CEO Sundar Pichai simultaneously admitted and defended the company in a memo to employees, noting that that they had fired 48 people over the last two years for sexual harassment, none of whom received financial payouts. Senator Chuck Grassley continued his support of newly confirmed Supreme Court Associate Justice Brett Kavanaugh by asking the Justice Department to investigate one of the women — Julie Swetnick — who accused him of sexual misconduct for potential conspiracy, making false statements and obstruction of Congress. Grassley also named Swetnick’s lawyer, Michael Avenatti, in his request. NBC News “Today” host and former Fox News personality Megyn Kelly will not be returning to the morning show after her comments defending blackface — the practice of light-skinned individuals darkening their skin with paint in order to portray black individuals — sparked a wave of backlash. 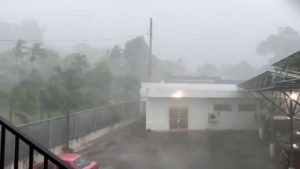 A storm batters buildings as Super Typhoon Yutu descends upon Saipan, Northern Mariana Islands, U.S., October 24, 2018, in this still image taken from a video obtained from social media. @emmaninspn/via REUTERS THIS IMAGE HAS BEEN SUPPLIED BY A THIRD PARTY. MANDATORY CREDIT. NO RESALES. NO ARCHIVES.